The long curved shape of these Almond Biscotti make them instantly recognizable. This is a traditional biscotti, which means they do not contain butter or oil. Their texture is crisp and crunchy with a sweet almond flavor that comes from pure almond extract and chunks of toasted almonds. They are especially good when dipped in melted chocolate. The most distinguishing feature of these Almond Biscotti is the chunks of almonds. Almonds are the nutmeat found inside the pit of the dry fruit on almond trees. This ivory-colored nut has a pointed, oval shape and smooth texture. Almonds come in sweet and bitter forms, and for this recipe we are using sweet almonds. Almonds have a delicate sweet taste and they are sold whole, sliced, slivered, or ground with skins on or off. For this recipe you can use either whole almonds that are blanched (skins off) or natural (skins on). I like to toast the almonds first as this brings out their wonderful flavor. Once the nuts have cooled, cut into large chunks. To intensify the almond flavor in these biscotti, we also add a little pure almond extract to the batter. Pure almond extract (always buy 'pure' not 'artificial') has a very intense almond flavor which is why we only need to add a small amount to achieve a really nice almond flavor in these biscotti. As you know biscotti means "twice baked" and it is the second baking that draws out the biscotti's moisture and how long they are baked determines how crisp and crunchy they will be. 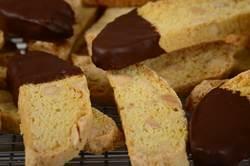 Biscotti are made by first forming the dough into a log and baking until firm. The log is cooled slightly and then cut into thin slices. The slices are baked until crisp which has the added bonus of giving them a long shelf life. Almond Biscotti: Preheat oven to 350 degrees F (180 degrees C). Place the almonds on a baking sheet and bake for 8-10 minutes or until very lightly brown and fragrant. Let cool and then chop coarsely. Reduce oven temperature to 300 degrees F (150 degrees C) and line a baking sheet with parchment paper. In a large bowl whisk the flour with the sugar, baking powder and salt. Stir in the chopped almonds. Then add the egg mixture and stir until a dough forms. Divide the dough in half, and on a lightly floured surface roll each half into a 7 inch (18 cm) log that is about 3 - 4 inches (8 - 10 cm) wide. Transfer logs to the prepared baking sheet and bake for about 35 minutes, or until firm to the touch (log will spread during baking). Remove from oven and let cool on a wire rack for about 10 to 15 minutes. Transfer logs to a cutting board and, using a sharp knife, cut logs into slices about 1/4 - 1/2 inch (6-12 mm) thick on the diagonal. Place the slices of biscotti on the baking sheet and bake about 10-15 minutes, turn slices over, and bake for another 10-15 minutes or until firm to the touch. (The longer you bake the biscotti the more crisp and crunchy they will be.) Remove from oven and let cool. Store in an airtight container for several weeks. For Chocolate Dipped Biscotti: Place 4 ounces (120 grams) of the finely chopped chocolate in a heatproof bowl and place it over a saucepan of simmering water. Once the chocolate has melted, remove from heat. Add the remaining chocolate and stir with a wooden spoon until it has completely melted and is smooth and glossy. Taking one biscotti at a time, dip one end into the melted chocolate and place on a parchment or wax paper- lined baking sheet. Once all the biscotti have been dipped in the chocolate, place the baking sheet in the refrigerator for about 10 minutes, or until the chocolate has hardened.